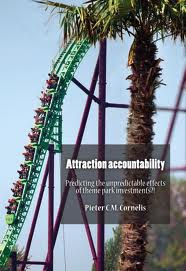 May 2011 I received a PhD for my dissertation “Attraction accountability: predicting the unpredictable effects of theme park investments? !” If you would like to find some information about this dissertation please visit my website www.pietercornelis.com. Althought this website is no longer updated, and I deleted a lot of information it might still be interesting for specific purposes. Should you be interested in more detailed information please don’t hesitate to contact me directly. Please find a free download of my Ph.D. dissertation “Attraction accountability: predicting the unpredictable? via this link.